This site includes American Indian articles , authors , books , film clip , videos , images , slide shows and more. Select "Category" and click "Sort" to view related images. Summary: James Trosper speaks on the significance and sacredness of the eagle in Indian life, and in particular in the Sun Dance. Dr. Talamantez speaks about the impact of the government and churches on indigenous people and the difficulty of following the "inner voice" of a Native American's Indian identity. Inés Talamantez of the Mescalero Apache suggests how any Native American can and should at any time pray to the Creator. She emphasizes that sincere prayers will be heard, and that all of this land is sacred. Dr. Talamantez addresses a message to Indian youth. She pleads with them to purify their minds, bodies, and spirits, to learn about their culture from books and elders, and to live in harmony with the sacredness of the natural world. Dr. Talamantez addresses young Native Americans, this time asking them to take pride in their Indian identity, which can be aided by learning the traditional language. She calls this language "the key to understanding the wisdom of the ancestors," and says that elders can guide young people to this wisdom. A member of the Mescalero Apache tribe, Inés M. Talamantez is a professor at the University of California, Santa Barbara. A graduate of Dartmouth College, Professor Talamantez is the author of Teaching Religion and Healing and has contributed articles to Native Religions and Cultures of North America: Anthropology of the Sacred and Unspoken Worlds: Women's Religious Lives. Film interviews with Professor Talamantez on American Indian spirituality and advice for American Indian youth are a featured part of the documentary film and DVD on the Crow Shoshone Sun Dance entitled, Native Spirit: The Sun Dance Way . It is generally recognized that Frithjof Schuon had a special interest in the spiritual traditions of the American Indians, but only some aspects of his relationship with them are well known. The online journal Vincit Omnia Veritas, which published six issues between 2005 and 2007, interviewed Michael Fitzgerald on the subject of Schuon's many decades of interest in, and study of, American Indian spirituality in its many dimensions. This interview, posted on the Religio Perennis website, remains one of the most in-depth explications of Schuon's frequent focus on many aspects of American Indian traditions. Fitzgerald also gives some important historical context to the life and times of Schuon, to his American Indian contacts and friends, and to the work of Joseph Epes Brown, a scholar of Indian Studies and a friend to both Black Elk and Schuon. The American Indian Culture and Research Journal summarizes this article by Fitzgerald in this way: “This article provides new information that will oblige scholars to reassess the legacy of Black Elk (1863–1950), including excerpts from recently discovered unpublished letters written by Joseph Epes Brown while he was living with the Lakota holy man (1947–49). The author provides insights into Brown's personal philosophy and a clearer context for the editorial role he played in recording The Sacred Pipe: Black Elk's Account of the Seven Rites of the Oglala Sioux. Brown's letters also help to illuminate Black Elk's role in attempting to restore the sacred “religion of the Pipe” among the Sioux and to clarify controversies that include Black Elk's dual participation in Catholicism.” For readers of Perennialist writings, it is noteworthy that Fitzgerald's article also includes important new insight into Frithjof Schuon's role in the chain of events leading to the recording of Black Elk's teachings on the Seven Rites. The essay sets out "to state the principle and explain its essential meaning" of the appearance in various traditions of "a sort of demiurge…who is both beneficent and terrible and who functions as both an initiatic hero and a buffoon." Focusing mostly on American Indian mythologies, but also employing examples from many other traditions, the author views the question from many angles but concludes that the forms of various traditional accounts of the demiurge may differ, but beyond all these, the "sole Revealer—the Logos—plays with mutually irreconcilable forms while offering a single content of dazzling self-evidence." This is a lesson given by author, editor, documentary film producer, and educator Michael Fitzgerald in September, 2013 to a class at Culver Academies in Culver, Indiana. Fitzgerald is a well-known author and editor of many books on American Indian subjects, and has many years of close relations with several tribes. He was the adopted son of the late Crow Medicine Man and Sun Dance Chief, Thomas Yellowtail. In this lesson, Fitzgerald gives a broad overview of the history of Native Americans as they came into contact with European and American settlers. Because his area of expertise and personal experience is mostly focused on the Plains tribes, Fitzgerald often uses the history of these tribes, but this survey is broad enough to cover the many diverse tribes as a whole. Fitzgerald delves into the history of encroachments, treaties, removal to reservations, and concludes with the voices of current-day Indian leaders discussing the challenge for their people to “live in two worlds” — the world of general American society, and the world of their traditional tribal values and culture. This 45-minute lesson can be used to supplement classes on history, sociology, current affairs, or other social studies disciplines. The PowerPoint slide show used by Fitzgerald will be available through the book publisher, Wisdom Tales. To go to the Wisdom Tales “Teachers’ Resources” web page, click here. This is a lesson given by author, editor, documentary film producer, and educator Michael Fitzgerald on September 10, 2013 to students at Culver Academies in Culver, Indiana. Fitzgerald is a well-known author and editor of many books on American Indian subjects, and has many years of close relations with several tribes. He was the adopted son of the late Crow Medicine Man and Sun Dance Chief, Thomas Yellowtail. In this lesson, Fitzgerald defines "sustainability" and then goes on to demonstrate how the Native Americans (focusing most often on the Plains tribes) incorporated profound values of sustainability into their various cultures. The lessons within the Native American traditions for other civilizations struggling to understand and adopt ways of sustainability are very clear. The film includes video clips on the rites of the Sweat Lodge, the Vision Quest, the Sun Dance, and more. The lecture was presented for Culver's Global Studies Institute, which is "a center for the study of international affairs that seeks to help students and all in our educational community become more knowledgeable, global citizens." This 52-minute lesson can be used to supplement classes on history, sociology, current affairs, or other social studies disciplines. The PowerPoint slide show used by Fitzgerald will be available through the book publisher, Wisdom Tales. To go to the Wisdom Tales “Teachers’ Resources” web page, click here. Native Spirit & The Sun Dance Way are two unique, feature-length documentaries contained in a 2-Disc DVD with an additional 90 minutes of rich special features. The total running time of both is 3 hours and 15 minutes. In The Sun Dance Way, the words of Thomas Yellowtail, a revered Sun Dance chief of the Crow Indian tribe, are brought to life by the internationally known Cree Indian actor, Gordon Tootoosis (Legends of the Fall). Unique photographs and video footage of sun dances, from as far back as 1903, reveal the symbolism and mystical beauty of the ancient ceremony which remains at the center of the Plains Indians’ lives today. “Once you know about these things, you will also love them, because you will see that without a sense of the sacred, you are less than a man,” said Thomas Yellowtail..
A beautiful full-color companion book, Native Spirit: The Sun Dance Way (seen on this page above), is also available. The words of Thomas Yellowtail, and quotes from elders from several tribes across the United States and Canada, are illustrated with breathtaking images of this unique cultural and sacred ceremony. The website for the DVD is at www.nativespiritinfo.com, where you will find clips from the DVD, information on the contributors, links, and much more. In color illustrations and lively stories, Caldecott Medal winner Paul Goble brings to life 26 traditional stories from various tribal nations, including the Lakota, Pawnee, Blackfoot, and Cheyenne. This collection of the most important articles by Frithjof Schuon on American Indians spirituality in accompanied by a selection of his paintings on American Indian subjects. Paul Goble again presents, in paintings and vibrant stories, meaningful traditional American Indian tales. The Boy and His Mud Horses features a collection of 27 traditional stories from different Native American tribes, including the Pawnee, Cheyenne, Blackfoot, and Lakota. A foreword by Albert White Hat, Sr., a nationally respected Lakota leader and linguist, is also included. Silver Midwest Book Award for "Religion/Philosophy/Inspiration"
In response to mounting environmental concerns, a defining characteristic of the latter part of 20th century American life is the increasing interest in Native American philosophies. Ernest Thompson Seton (1860-1946) was one of the earliest supporters of the political, cultural, and spiritual rights of First Peoples, and as a corrective to the materialistic worldview and environmental abuses of our day. The Gospel of the Redman is a prophetic work. Through its striking combination of stirring oratory and majestic portraiture from the Plains Indian pre-reservation “old-timers,” Indian Spirit reveals the very heart of the traditional Native American life-way: a world where dignity of soul, nobility of sentiments, discipline of gesture, and a sense of the Great Spirit in all things, reigned supreme. This heroic ideal of the Native American, blending the courage of the warrior with the wisdom of the priest, stands as a timeless exemplar for all peoples. Gold Midwest Book Award for "Culture"
Silver Benjamin Franklin Award "New Age/Metaphysics/Spirituality"
Native Spirit: The Sun Dance Way is the story of the remarkable preservation of an ancient cultural and spiritual way of life. In this companion book to the two documentary set Native Spirit & The Sun Dance Way, American Indian tribal elders and spiritual leaders tell of the struggle to preserve the way of their Grandfathers in the face of a government bent on their destruction. With over 100 color and sepia photographs from as early as 1903, along with the images from the only video footage officially sanctioned by the Sun Dance, this book reveals the symbolism and mystical beauty of the ancient Sun Dance ceremony, which still remains at the center of the spiritual life of many Plains Indians today. What was the role of women in the world of nomadic American Indians in the 19th century? The Spirit of Indian Women provides a unique glimpse into a world that is almost inaccessible in our time. Through the combined power of photos, art, and the wisdom of traditional voices, modern readers can come to feel something of the timeless spirit of Indian women. The writings of Joseph Epes Brown are considered amongst the most important studies on the North American Indian undertaken in the 20th Century. His works have been translated into numerous languages and are re-igniting interest in American Indian religious tradition. The Spiritual Legacy of the American Indian: Commemorative Edition, not only presents his works on the fundamental and universal characteristics of the American Indian culture and tradition, but the previously unpublished correspondence sheds light on Dr. Brown’s time spent on the reservations immersed in the very cultures and peoples that he wrote about. His letters also shed new light on the ongoing debate as to the extent to which Black Elk was a sincere Catholic. “When I was a little boy, my mother made me a small tipi and painted it with Native American symbols. It excited my interest, and made me want to know more. This book is the kind of book I began looking for, but never found. So I have made it for you.” These are the opening words to world-renowned artist, Paul Goble’s latest work, Tipi: Home of the Nomadic Buffalo Hunters. Through his award-winning art, and the stories and tales of the old-timers, Goble examines the construction and art of the tipi, which was more than a simple dwelling for the Plains Indians, but rather an expression of their belief in the spirituality of the world around them. Libraries and some readers may be interested in the hardcover edition of Tipi: Home of the Nomadic Buffalo Hunters. Click here to go to the detail page for more information or to order the hardcover edition. 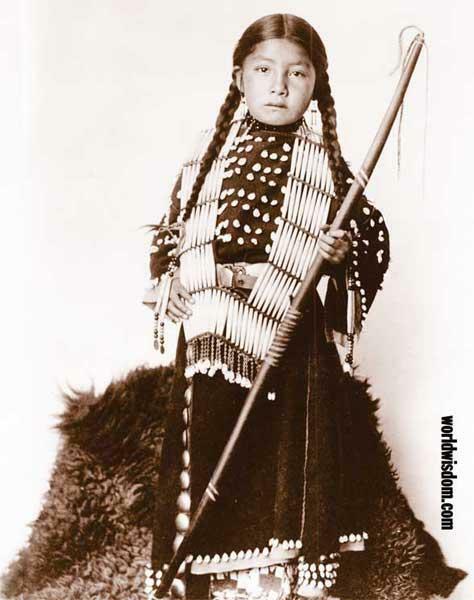 The photographs and stories of Edward S. Curtis (1868-1952) speak through time of a bygone age. His work acts as a bridge between generations and allows readers to experience firsthand the culture of the Indians of North America. Between 1889 and 1930, Curtis traveled throughout North America photographing and recording the stories and lifeways of the last generation of Indians from the “Buffalo Days”. Beginning in 1907, he gradually published his 20-volume masterwork, The North American Indian. John Arlee is a Salish traditional spiritual leader and teaches both the Salish language and Salish tribal history at the Salish Kootenai College in Pablo, MT. Black Elk (Nicholas) (1863-1950) was an Oglala Sioux spiritual leader and medicine man. He was the second cousin of Crazy Horse. Black Elk participated, at about the age of twelve, in the Battle of Little Big Horn of 1876, and was wounded in the massacre that occurred at Wounded Knee in 1890. Elenita and Marina (Weatherly) Brown are the wife and eldest daughter respectively of noted scholar of American Indian spirituality, Joseph Epes Brown. Tantoo Cardinal is a vetern actor, who films credits include Dances with Wolves, Legends of the Fall and Smoke Signals. Rodney Frey is a Professor American Indian Studies and Anthropology at the University of Idaho. Paul Goble is an award winning author and illustrator of children's books. To date, Mr. Goble has illustrated over 28 books, including the World Wisdom titles All Our Relatives and Tipi: Home of the Nomadic Buffalo Hunters. Mr. Goble also wrote the Foreword to The Gospel of the Redman: Commemorative Edition by Ernest Thompson Seton and Julia M. Seton. His best known work, The Girl who Loved Horses won the prestigious Caldecott Medal. Dr. Âke Hultkrantz was recognized as a major authority on Native American religions and shamanism. He was a professor of religion at the University of Stockholm, Sweden. During the years 1948 and 1958, Professor Hultrkrantz conducted field work at the Wind River reservation, which resulted in his ground-breaking book, Native American Religions of North America: The Power of Visions and Fertility. His other works include The Religions of the American Indians, Shamanic Healing & Ritual Drama: Health & Medicine in the Native North American Religious Traditions, and Belief and Worship in Native America. Chief Looking Horse contributed to the Conversations with the Elders section of Native Spirit & The Sun Dance Way and its companion book Native Spirit: The Sun Dance Way. A selection of video clips of Arvol Looking Horse can be viewed in the Video Clips section of this page. Oren R. Lyons is a traditional Faithkeeper of the Turtle Clan, and a member of the Onondoga Nation Council of Chiefs of the Six Nations of the Iroquois Confederacy (the Haudenosaunee). He is Associate Professor in the Department of Native American Studies at the State University of New York in Buffalo. Lyons co-founded and publishes Daybreak, a national American Indian quarterly news magazine. He also edited the book Exiled In The Land Of The Free: Democracy, The Iroquois and The Constitution (1992), and is an accomplished illustrator and painter. Medicine Crow wrote the foreword to Paul Goble's All Our Relatives, and Native Spirit: The Sun Dance Way by Thomas Yellowtail. A selection of Video Clips of Interviews with Joe Medicine Crow can be view above in the Video Clips section of this page. Dr. Janine Pease is the founding president of the Little Big Horn College in Crow Agency Montana, a past president of the American Indian Higher Education Consortium (for two terms), a director of the American Indian College Fund (for seven years), and was appointed by President Clinton to the National Advisory Council on Indian Education (for eight years). Frithjof Schuon is best known as the foremost spokesman of the Traditionalist school of comparative religion. The author of more than 25 books on spirituality, he wrote extensively on the beliefs of Plains Indians tribes. A friend of Thomas Yellowtail and Joseph Epes Brown, he was an adopted member of both the Crow and the Sioux tribes, and was given the name of Wambali Ohitika – Brave Eagle – by Chief James Red Cloud (grandson of the great Sioux chief). Schuon was also a well respected painter. One of the dominate themes of his art were American Indian subjects. Co-founder of the Boy Scouts of America, naturalist, author, and painter Ernest Thompson Seton, was born in England in 1860. His stories and paintings of wildlife are standard works on nature study and wood lore for boys and girls that continue to be used today. Together, with Lord Baden-Powell, Seton created the Boy Scouts of America as an organization that would respects nature's gifts. Seton was especially concerned with the plight of American Indians as well as the environment which is throughout his writing. Author of over 50 books, Mr. Seton's message that the natural world is to be respected and nutured is more relevant today than ever before. He died in 1946. A veteran of over 40 films and member of the Cree Tribe, Tootoosis has appeared with such stars as Ben Affleck and Charlize Theron in Reindeer Games (2000) and joined an all-star cast in Legends of the Fall (1994) with such actors as Brad Pitt and Anthony Hopkins. In Native Spirit & The Sun Dance way, Gordon Tootoosis stars as the voice of Thomas Yellowtail. A selection of Video Clips from interviews with Gordon Tootoosis can be view in the Video Clips section of this page. Trosper wrote the foreword to Indian Spirit: Revised and Enlarged edited by Michael Fitzgerald and Judith Fitzgerald. He is also featured in the Conversations with the Elders section of Native Spirit: The Sun Dance Way. Video Clips of James Trosper can be seen in the Video Clips section on this page. Born in 1903, Medicine Man and Sundance Chief Thomas Yellowtail was a pivotal figure in Crow tribal life and one of the most admired American Indian spiritual leaders of the last century. As a youth he lived in the presence of old warriors, hunters, and medicine men who knew the freedom and sacred ways of pre-reservation life. As the principal figure in the Crow-Shoshone Sun Dance religion during the last half of the 20th century, he has perpetuated the spiritual traditions of his Crow tribe as one of the last living links to the pre-reservation days. He died in 1993. A selection of video clips taken from interviews with Thomas Yellowtail can be found in the Video Clips section above. Joseph Fitzgerald is an author and editor of books on subjects that include Buddhism, Hinduism, the American Indians, Christianity and the Perennial Philosophy. At four years of age he was adopted into the Crow tribe and the family of Thomas Yellowtail, one of the most honored American Indian spiritual leaders of the past century. Yellowtail was to provide Fitzgerald and his parents with introductions to many spiritual leaders of other American Indian tribes; thus Fitzgerald has spent extended periods of time over more than thirty years visiting traditional cultures and attending sacred ceremonies throughout the American West, including the sacred rites of the Crow, Sioux, Cheyenne, Shoshone, Bannock, and Apache Tribes. He is the editor of The Cheyenne Indians: Their History and Lifeways, Edited and Illustrated, by George Bird Grinnell. Tipi: Home of the Nomadic Buffalo Hunters, click here. You will need to have Macromedia Flash (version 8 or newer) on your computer to see this presentation. A slow internet connection will require a bit of waiting, too. Click here to learn about Flash Player or to download it for your web browser. World Wisdom's award winning graphic designers have prepared a selection of free eProducts based on American Indian themes. To visit our eProducts page click any of the links below. • Ernest Thompson Seton explains "The Gospel of the Redman"